The Black Sox and the thrown World Series. Baseball (the business) stands indicted. Baseball (the sport) has received a blow from which it will be a long time recovering. Eight ball players, men who were honored above their station or deserts, by a thoughtless public, have been revealed as takers of bribes. The officials, to whose welfare the business and sport of “organized” baseball was entrusted, have been exposed as incompetent. The honest ball players, or the majority of them, stand before the public as mildly guilty of being accessories after the fact, in that all save a few knew or suspected that crookedness was going forward and failed to protect their own reputations, their business and the sport from the ones who were guilty. The revelations made by the members of the Chicago White Sox team in their confessions before the Chicago Grand Jury shocked the entire nation and, worse, wrecked the faith of millions of boys. The most severe blow to the sport was not that these skilful athletes sold their loyal support and accepted bribes from gamblers, but that baseball can be made crooked without detection by outsiders. It has been the favorite defense of club owners, umpires and players in every case in which collusion between players and gamblers been alleged that the game could not be played dishonestly for any length of time without detection. It was this theory that enabled the dishonest players and the gamblers to reap their harvest. They proved that the game can be and has been successfully manipulated, provided the honest players on the teams do not “squeal.” They proved that the theory that outsiders can detect signs of crooked work is erroneous. 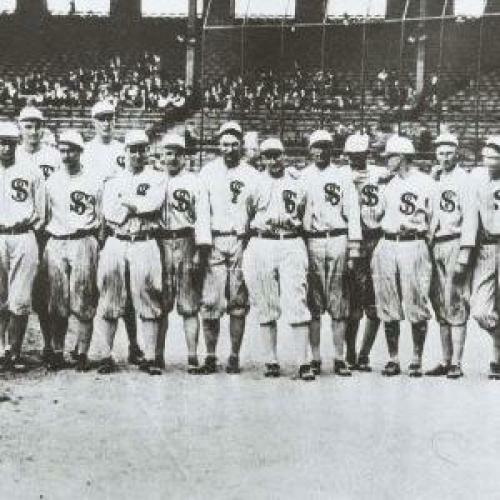 In the series of games played for the World's Championship in 1919 a number of the White Sox players agreed to lose games. Information that all was not well with the series was furnished to me prior to the opening game. I confided my information to Christy Mathewson, one of the most honest of players and managers and the man who, while manager of the Cincinnati club, exposed and dismissed Chase on charges of crookedness. Neither of us believed the reports true. Yet we watched every game and every play, and in the eight games we marked as “suspicious” just seven plays. Any one of those plays could be explained on the theory that the mistakes were honestly made, as well as on the theory of dishonesty. Plainly the outsider cannot tell to a certainty. An honest player on any team, however, will know within a short time, whether or not his fellows are “trying” to win. The hope of the future, therefore, lies in securing players of character to disregard the code of the underworld which has ruled the game. The ethics of criminals, especially gamblers, forbid informing upon the guilty and, so long as the ball players who are personally honest persist in adopting this code, it will not be difficult for those players who are willing to sell themselves to find buyers. This corrupting and attempting to corrupt ball players commenced more than twelve years ago. Prior to that time there were veiled charges that certain managers and owners had attempted to influence players on opposing teams to keep out of important series or to “go easy," which means to permit their teams to win. With the general closing of horse racing and its attendant gambling in many parts of the country that element of crooks who had lived upon the large class designated as “suckers” turned to baseball. Until that time they were not familiar with the sport excepting those who preyed upon Boston and Pittsburgh, which, being non-horseracing towns, found their interest in baseball. The common delusion that baseball could not be successfully “fixed” also acted to restrain them from turning their activities to the national sport. Somewhat to their surprise the gamblers who were driven out of their business of making books on horse races, because they were unable to get direct telegraphic news, found that baseball was an even more lucrative field and that it was a much better “sure thing” than horseracing as a gambling proposition. The result was that in Chicago, New York, St. Louis and other cities of the National and American league, pool selling and wagering on baseball became a huge gambling system, handling more money in small wagers even than the famous policy rings once handled. Immediately there were whispers of crookedness, especially at times when the baseball interest of the country was centered upon the World's Series games. The big professional gamblers became almost as much a part of the World's Series as were the players. The result was not hard to predict. In one World's Series a manager was secretly accused of making a change of pitchers at the command of gamblers. In another series there were ugly rumors concerning the conduct of a famous player who shortly afterward retired. In another series the scandal almost reached the point of an explosion, and the rumors concerning it have persisted ever since. It remained for Hal Chase, perhaps the greatest of all first basemen, to bring the conditions near a climax. His manager, Christy Mathewson, charged that he was losing ball games purposely by means of deserting his post at first base, making brilliant stops and tossing the ball over first base so quickly that the pitcher could not reach the base in time to catch the ball. In each case the pitcher was criticized and Chase praised. Ultimately he approached other members of the team with offers of money to aid him, and Mathewson learning of it, immediately suspended him. Chase's case was given a hearing, affidavits were produced to prove his connection with the case, but as usual, the players who were in possession of facts evaded giving testimony. Chase was cleared of the charge and promoted from the Cincinnati to the New York team. The Chase case gave many players the idea that they could play dishonestly and not be discovered, or if discovered or suspected, would be cleared. They believed the club owners feared publicity so much that they would be safe. The club owners have always adhered to the policy of secrecy and have whitewashed every scandal and charge of crooked work on the grounds that it was “for the good of the game.” Their policy encouraged the crooked ball players and tempted the weak ones who until then had remained honest. During the season of 1919 gamblers openly boasted that they or others controlled ball players on a number of clubs. The former racetrack gamblers, who dislike baseball save as a means of mulcting the public, sneeringly asserted that the game was more crooked than horseracing ever was. Through it all the officials in charge of baseball adhered to their policy of curing an evil by declaring it did not exist and by using their influence over consciously or unconsciously subsidized sporting writers to suppress the accusations and punish those who demanded an investigation. There was one man who gave more thought to the sport than to the money. He was Charles A. Comiskey, who as ball player, captain, manager and owner, amassed a fortune in the game. His players were accused. He stood to lose more than all the others. Yet he insisted upon proving or disproving the charges against his men. Hoping they would be disproved he proved them, and when the proof was furnished he expelled players worth a quarter of a million dollars to him from this club, and forced their indictment for conspiracy. Baseball in the hands of men like Comiskey is safe and clean. But, since the sport became the second largest amusement enterprise in America it has attracted investors who are liable to forget the sport and remember the box office. Baseball hardly can be purged of crookedness while, among those who own clubs are men who are themselves gamblers and interested in gambling businesses. This article appeared in the October 20, 1920, issue of the magazine.